Calvin and Hobbes is my favorite comic, ever. The brilliance and imagination are timeless, and as many times as I reread the collections, they never get tiresome. I felt a lot like Calvin, growing up. (There were even some attempts at wagon-riding down a couple of steep hills, in winter. Fortunately the snow was a good cushion.) My Hobbes was a space-faring invisible velociraptor named Zane. While I couldn’t quite achieve the level of snow-art Calvin did, we did make snow dinosaurs one year. I didn’t like camping or organized sports. I liked space adventures and superheroes. What Calvin and Hobbes showed me, as the first comic strip I read and latched onto forever, was that it was okay to be imaginative and weird. You could have adventures and be anything you wanted in your imagination. 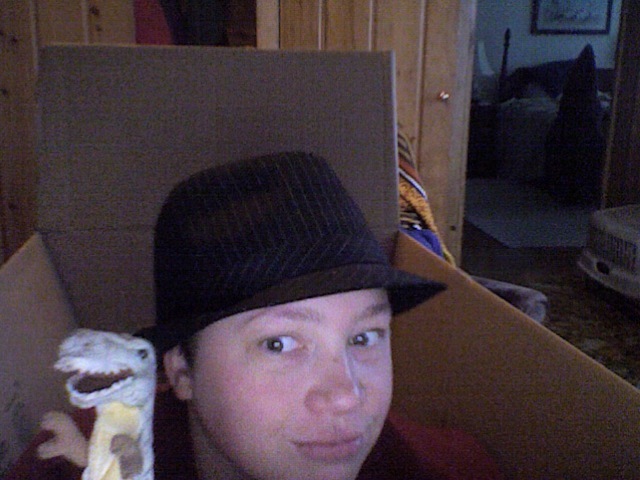 Oh, yeah, and the cardboard box. At some point while aging upwards, certain ideas get ingrained by the gelatinous glob of Growing Up: the ideas that cardboard boxes and imaginary friends and stuffed animals are for kids, and once you hit the point where you’re “too old” for this stuff, you have to leave it all behind. No looking back. You’re not six anymore, so no, you can’t have an invisible space-faring snarky velociraptor as a friend. Don’t go stomping in mud puddles; toys are just for collecting, now, as a hobby. And you shouldn’t play in cardboard boxes. It might be subtle or it might be explicit, someone might tell you straight out what you can and cannot do, or you might absorb things through the osmosis of adulthood. But you start feeling ashamed for wanting to play with stuffed animals or hide in a cardboard box and pretend it’s a spaceship. There’s one kind of cardboard box, though, that you can still go to: books. Books are wonderful creatures, because they offer you a safety net: you can read about spaceships and talking animals and wilderness adventures and duels and swashbuckling and duels and daring-do and your imagination goes wild. You can write those books, and draw them, too, and this is marginally more okay than playing in a cardboard box. So you do that. You read and you write and you watch movies and tv shows and sometimes draw things. You love all these things, you will never stop loving them. And it’s great; it’s the new cardboard box, like Calvin’s Transmorgifer which is also a time machine. All of that becomes part of you: the reading and writing and watching and exploring and Life That Happens. You keep aging upwards, trying to hit that mythical “grown up” state people expect you to hit, and eventually you learn how to craft a mask out of adulthood and wear it around. But. Sometimes… sometimes it feels like you could do more when you were small. That doesn’t mean you devalue any of the art and books and music and movies and writing you consumed or created. No. You wouldn’t give any of that back; you want more of it, you always will. It’s more of this tiny little spot of regret that you stopped doing another thing which made you happy. Sometimes, you pieces of your imagination get full of cobwebs and dust. You catch yourself trying to think the way other people expect you to think. Sometimes, you wonder if you lost some of the things that made you happy, that made you you, and maybe they’re gone forever. So you take the box home. It’s a nice box; it folds up neatly for storage, because it’s a very polite box and doesn’t want to take up too much of your space. It knows what a box is supposed to be, because the world has told it what defines a box: plain, boring, practical, not worth very much. You don’t believe that, of course. And suddenly, the box expands. Now it’s everything it ever wanted to be: it’s a battleship or a mech or a spaceship or a submersible. It’s a castle and it’s a secret underground bunker and it’s a dragon cave (and the dragon). It can travel through hyperspace and avoid Imperial star destroyers faster than the Millennium Falcon. Maybe it is the star destroyer. It can be anything, after all. “Why not?” the box asks. You might say a dozen things, a million things, to defend why you shouldn’t. Why other people, the world, societal constructs, say you shouldn’t act like a six-year-old and play in a cardboard box. But you don’t say any of that. Why not, indeed? Imagination doesn’t exist to be stuck on a shelf somewhere once you graduate past the appropriate age of playing in boxes. You don’t have to confine it to paper and words and a 17″ screen. You can read books and write stories and watch movies and create things and you can play in cardboard boxes if you want. Growing up doesn’t have to mean giving up space adventures and time travel or dinosaurs. Or boxes. Not forever. Excellent article! I believe in the power of imagination. That’s why I rarely buy those expensive toys in toy stores for my kids. In a few months, they’ll most likely end up in the trash. They have more fun in building play homes and houses using cardboard boxes for sale. The adults, me and my husband, also have time in helping them make their cardboard box toys.